A comparatively new — and popular — prostate cancer therapy can be shorter (and more intense) than standard treatments. But it's efficacy is unproven. And there's insufficient data so far to compare side effects. According to an article by Gina Kolata in The New York Times today, the new treatment — called SBRT, or stereotactic body radiation therapy — usually involves five sessions within two weeks instead of 40 seasons spread over two months or 28 sessions over five or six weeks. The National Cancer Institute (NCI) has just agreed to fund a clinic trial that will compare the SBRT and 28-session treatments, although it may be eight years before the results are finalized. "Ideally," the Times quotes Dr. Rodney J. Ellis, a radiation oncologist at Case Comprehensive Cancer Center in Cleveland and the principal investigator for the trial, as saying, "we want to show five treatments is better." The Times pieces says the number of men getting SBRT more than doubled between 2007 and 2013, according to the most recent Medicare data. Prostate cancer strikes about 180,000 men annually, second only to lung cancer. 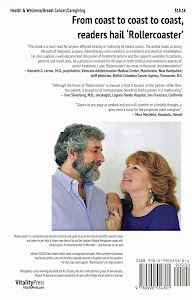 Some clinical trials, Kolata's story indicates, have provided "important information. For example, a recent one shows that hormone-blocking drugs can prolong life for men whose prostate cancer recurs after surgery to remove the prostate." The article also indicates that a change in attitude seems to be occurring. In favor of the shorter, more intense treatments. Kolata's article quotes Dr. Michael J. Zelefsky, a Memorial Sloan Kettering Cancer Center radiation oncologist, to the effect that "several years ago, 90 percent of his patients had the standard course of treatment. Now 90 percent choose the shorter course." The newer treatment, he added, "is emerging as a very exciting form of therapy." Why? Probably because more patients are considering "quality of life" issues and the shorter length of therapy may add to that. Want an additional look at clinical trials and new treatments? 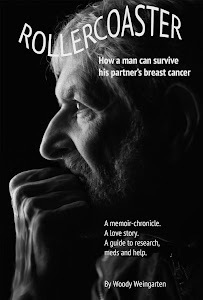 "Rollercoaster: How a man can survive his partner's breast cancer," a VitalityPress book that I, Woody Weingarten (a guy who's undergone regular radiation, brachytherapy and hormonal therapy for prostate cancer), aimed at male caregivers, provides it.